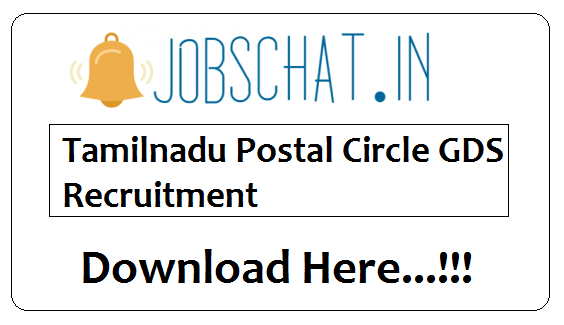 The searchers may apply to this Tamilnadu Postal Circle GDS Recruitment 2019 through this www.tamilnadupost.nic.in recruitment official page through this link almost all the candidates may include the to start the Tamilnadu Postal Circle GDS Application Form filling process, which is needed to end up the application form before the closing date. The officials release the overall 4442 posts at the main site, to hire the suitable candidates. So who aimed to get the government job those ones can apply the Tamilnadu Postal Circle GDS Notification. We are given the download links of the Tamilnadu Postal Circle GDS Recruitment Notification from this page. To apply this posts, the starting date is 15 March 2019 and the closing date is 21st April 2019 28th April 2019. Tamilnadu Postal Circle GDS Application Dates Extended !!!!! Latest Update On (20th April 2019): India Postal department extended the Tamil Nadu GDS Application Form from 15.04.2019 to 28th April 2019 and Last Date For Fee Payment is 18th April 2019.
Who is waiting for the TN Postal Circle Recruitment?, those ones without any delay apply this Tamilnadu Postal Circle GDS notification, because of 4442 TN Postal GDS vacancy is now in the activate State. The main qualification of this post is the 10th class with the highest marks n the mathematics and English, and also have to know the knowledge about the Tamil language. So who having those qualifications, those candidates can apply the Tamilnadu Postal Circle GDS Recruitment 2019. So before applying these posts, the candidates once study the whole notification because you have to know the TN Post Office Recruitment Details, so we are provided all the details about the TN Postal Circle Gramin Dak Sevak Recruitment on this webpage Jobschat.in. If you study the whole article you can get an idea about the www.tamilnadupost.nic.in Recruitment. The Tamilnadu Postal Circle officials release the TN Postal Circle Gramin Dak Sevak Notification at the main page, we are directly given the official page link. If you scroll down the webpage you can get the download link of the Tamil Nadu Gramin Dak Sevak Notification. So after downloading the notification, once refer the whole notification terms and conditions, after that apply the www.tamilnadupost.nic GDS Recruitment. So candidate remembers one thing only a few days having to apply this post, without waste your time immediately apply this post. Candidates remember one thing, applied candidates must and should have 60 days computer training certificate. Candidates must have the Secondary School Examination pass certificate of 10th standard with passing marks in Mathematics and English (having been studied as compulsory or elective subjects) & The candidate should have studied the local language at least up to 10th standard [as compulsory or elective subjects] & have Basic Computer Training. The age limitations of the Tamilnadu Postal Circle GDS Recruitment is Mentioned in the below. The application fee details of the Tamilnadu Post Office Recruitment is provided on the below page. The TN Post Office GDS Vacancy details mentioned in the below. Who successfully finish the application filling process, those candidates only promote the next round. So interested and willing candidates can apply the post with the help of the TN Post Office GDS Application Form. Before opening the application form registration should be made if someone is new. For the sake of the candidates, we have mentioned the link of the Tamilnadu Postal Circle GDS application Form. In this post, does not have written exam because the selection process will be depending upon the 10th class marks, so who gain the highest marks in SSC, the official select those candidates So it will be depending upon the merit list. Candidates above table, we are mentioned the details of the eligibility criteria those are education qualifications, age limitations, application fee, pay scale, and TN Postal GDS vacancy details. Some of the candidates struggled to Download www.tamilnadupost.nic.in Recruitment Notification, for that reason, we are provided with the TN Post Office GDS Notification Link below. To apply this post, you have to study those details. You can apply the Tamilnadu Post Office Recruitment before the one week of the last date because at the last date server is very rush, to avoiding that situation you can finish the application process before the deadline. So after completion of the application submission process, officials provide the merit list also.